15 buttons computer mouse have you ever seen one or operate on one? Yes, there is a computer mouse that has 15 functional buttons. Corsair Vengeance M90 Wired Laser Gaming Mouse w/ 15-Buttons (5700dpi) sell for about $30 or so if you can get good discount. Features 15-buttons including 9 macro keys; Solid aluminum chassis, onboard memmory with quick profiles, and on the fly DPI adjustment. Check out the videos below to see what it can do. This remind me of the time when I was working in the warehouse more than a decade ago, there’s a machine call a forklift, the controller joystick has that many buttons as well, and it run smooth accuracy rate is incredible, I guess it’s like driving an airplane or helicopter 🙂 those buttons are at all at the tip of your finger, it does take some practice, but once you get the hang of it it’s hella fun and piece of cake. 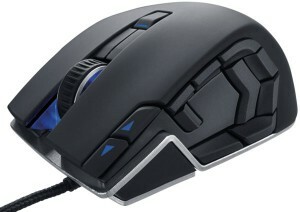 Awesome gaming mouse I bet accuracy with 5700 dpi.